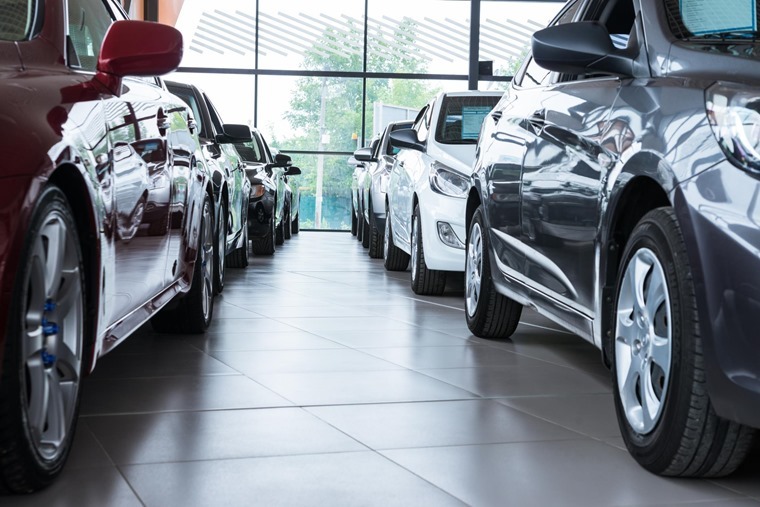 The UK new car market declined by –2.9% year-on-year in October, with 153,599 new vehicles registered, according to the latest figures from the Society of Motor Manufacturers and Traders (SMMT). The fall has been blamed on model changes and a supply issues across certain brands, as car makers struggle to cope with the newly introduced WLTP emissions certification process. 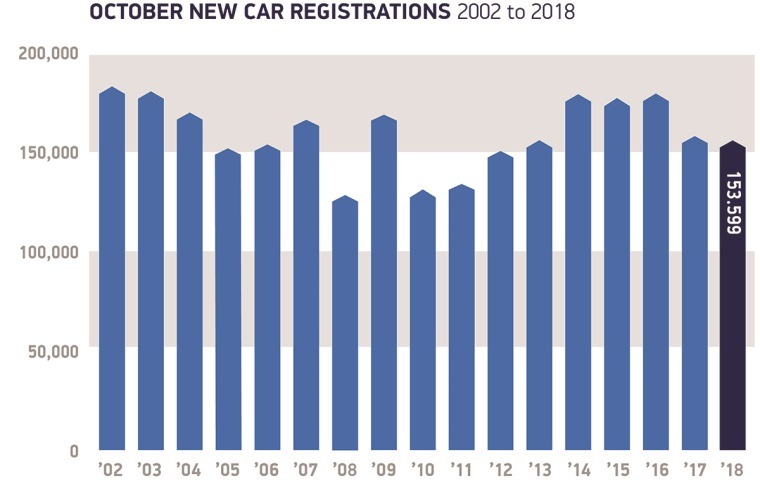 This has caused volatility in recent months, with registrations shooting up before the deadline in August (usually a quiet month for the market), and falling by more than 20.5% in September (usually the busiest month of the year for registrations). 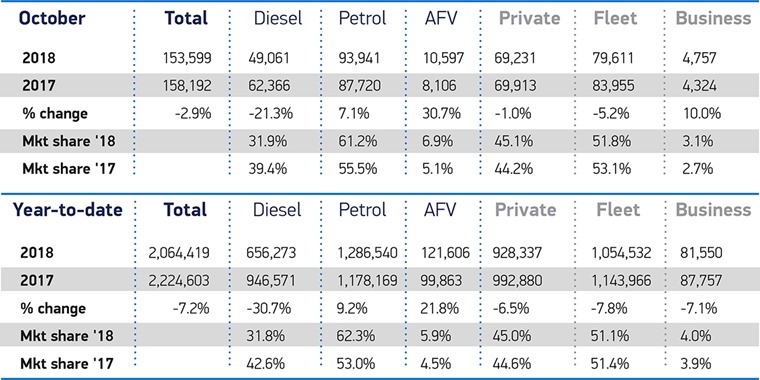 Declines were seen in both private and fleet sectors, with registrations down -1.0% and -5.2% respectively. Meanwhile, demand for diesel was down –21.3% compared to the same month in 2017 – something the SMMT blames on the continued confusion that has arisen due to government policy on the fuel. Petrol registrations rose 7.1%, while the market for alternatively fuelled vehicles (hybrids, plug-ins and EVs) rose 30.7% as a range of new models hit the market. Overall, however, the growth failed to offset diesel’s decline. Zero emission battery electric vehicles saw particularly impressive growth, up 86.9%, as 584 more people drove one home than in the same month last year. Hybrid and plug-in hybrid vehicles, which make up the majority of AFV sales due to their greater flexibility, also enjoyed strong uplifts, growing 31.0% and 19.1% respectively. However, this is not surprising given the announcement that the Plug-in Car Grant was to be cut for pure electric cars and withdrawn completely for plug-in hybrids – although, due to lead times, the full impact may not be seen for several months. As for the cars themselves, the Fiesta and Golf remain first and second for both October and the year to date, while last month saw the Mercedes-Benz A-Class make it in to third position – proving that the all-new model is a big hit. Year-to-date, the new car market is down –7.2% – largely in line with SMMT forecasts. Some pull-back is expected during the remaining months of the year, as manufacturer supply issues ease.